Edited by shadow_rusty, 01 July 2014 - 01:02 PM. There will always be a difference in roll on from car to car no matter what setup you have. not when the track applies brakes all the cars stop instantly, at jans and Birkdale the most we have seen any car roll on is about a car length regardless of the type of hand controller used. But even a Revell will stop faster with brakes applied than with an open circuit. Also, I've been thinking about brakes on track call for quite some time as I'm in the process of wiring up my own track, and roll on into a hairpin can damage things. I've even managed to do it for a scaley digital powerbase running in analog mode without the data cable, and without modding the powerbase. Added a DPDT relay into the controller extension cables, which switches between dead short (brakes in SSD) and controller output. Edited by axman, 01 July 2014 - 01:00 PM. I will be starting a new track build soon, and will be wiring it up this way. I'll also be hitting up the guys with the other tracks I race on to wire up this way. Two questions, which is nc and which is no on the relay contacts? And, will anything bad happen if you fit one of these to your controller, and the track has one aswell? Better save this one incase it gets deleted. Edited by espsix, 01 July 2014 - 03:40 PM. 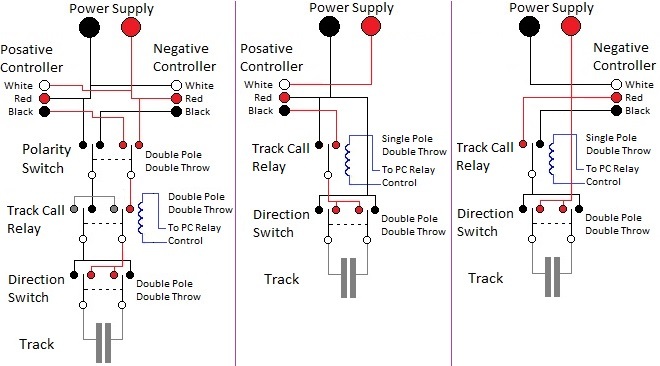 Thanks for sharing those diagrams Rusty.........do you want to add a copy to the track wiring master thread eh? Nothing bad will happen if you 'double' up on the relays. Nc and no are determined by your pc harness. Personally for the track side I would use nc as track running and no as track call. This means that if the pc is off the track still works. Brakes on the controller side should always be nc is brakes and no is running. No worries at all with sharing. Feel free to move / copy this wherever you feel is more appropriate or useful. Ps. Glad it's been useful. I agree with the fairness of 'track braking' on ALL lanes, but from a motor builders point of view, I would like to see a 'LOW oHms' resistor, rather than a dead short across the track as the brakes - in the region of 0.5 to 2.0 oHms. 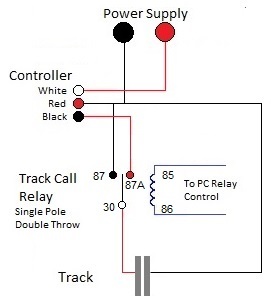 My reasoning is that when a hand controller applies 'full brakes' it is providing a short circuit at the controller socket, but I would suggest that most track wiring would have about 0.5 oHms between the power source and the controller socket. This is just my thinking. Dennis you think of things others don't You have way more electrical knowledge than i do but i think this is fundamentally an idea for scale racing. Group 15 and above is really only raced on a tiny number of tracks percentage wise of all tracks that are run. 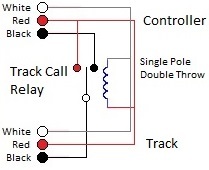 A track that provides braking on a track call creates an even playing field because no one gains an advantage because of the controller used. Some will say that heavier bigger geared cars will still roll more but they are slower to get going again so the status quo is renewed.